Art saved me. It has that power. Not that I was in trouble — I wasn’t. I got in enough trouble in my youth, true enough, but it’s not that kind of saving I needed. I needed to be saved from the mundane, to have a outlet and a language in which to express myself. I needed the language I call art. As I was thinking about my beloved road paintings that I’ve been writing about recently, I got to thinking about “the roads not taken.” We all have plenty of those, I think. I was brought up in West Michigan, in a wonderful but conservative, Dutch Reformed family that I love with all my heart. But my soul — my soul is Brazilian, like Carmen Miranda at Carnival. (But with much fewer people, because at heart, I get my energy by being alone. You get the idea.) Still, my little soul was not conservative, Dutch Reformed at all. But much as I might not like it, that darn Midwestern Dutch DNA was deeply ingrained in who I am, and it reminds me of roads NOT taken. The time I went to Mexico to study art, secretly hoping I would end up moving there, but no, I just couldn’t wrap my mind around not having a steady job and being that far away from my roots. That anxiety that came as part of my DNA package. Couldn’t do it, and worse, I found I didn’t really want to. After my six-week study program was over, I came home. There was the dream I had to spend a year traveling Europe picking grapes in October and finding odd jobs here and there. My longest trip there was 10 weeks and prepaid; no finding work along the way for me. There was the invitation to hop on the back of a bike in Ethiopia and travel on that bike to Cape Town with a very handsome man. I wanted to be the type of person that could do that, to sleep under the stars in Africa, but all I could think was black mambas also sleep under those stars and god knows what else — oh, there’s that anxiety again. But I was in Ethiopia. I was there for two months that year and have returned eight times. In that way I have always been true to myself. So I choose a life my mom has always described as roots and wings. But the roots have never interested me to paint; it is the wings I always turn to. I paint what that road from the back of a bike might have looked like, but I view it from the safety of a truck. 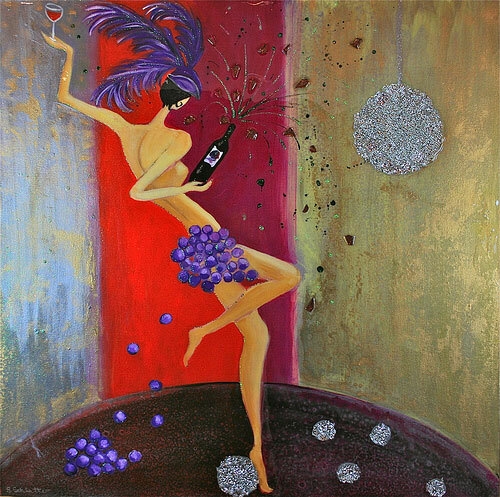 In my Goddess of Wine series, I paint the absolute carefree spirit. That series was greatly influenced by Josephine Baker, who just looked so damn celebratory and free of any anxiety. Yes, I want to paint that. My inner Carmen Miranda. I paint from the perspective of being always barefoot with the wind in my hair. I am so very at peace with who I am and the roads I have taken that have been far greater than I could ever imagine. But in my art — well, there I get to explore any world I wish to create, and then you, my viewer, in turn get to bring your inner world, secret fantasies, roads traveled or not, to my art and let it remind you of whatever it is that makes you smile, whatever floats your boat. 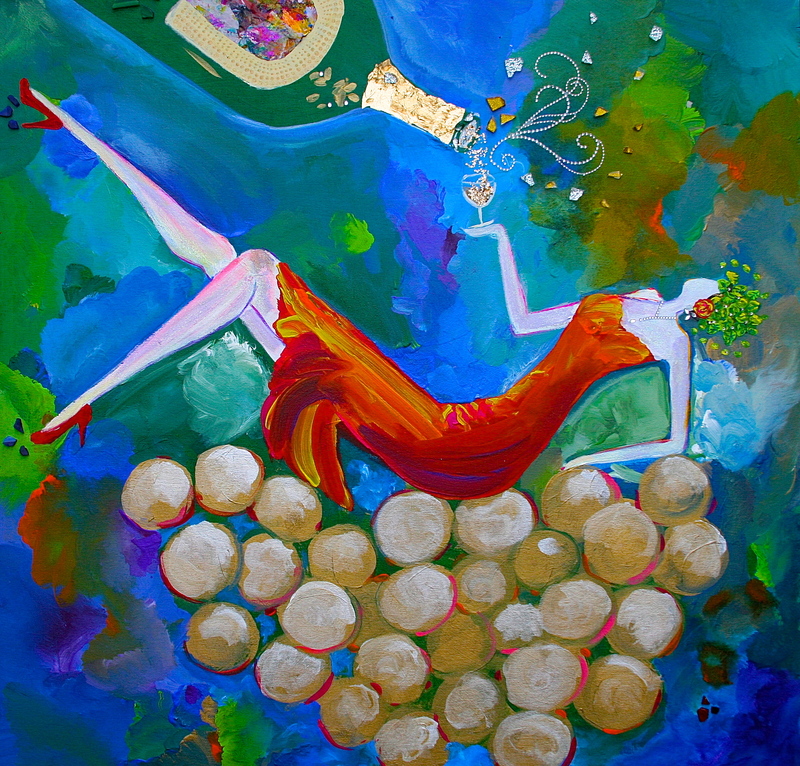 In that way, the art collector gets to have as much fun as the artist herself. Note: I am also a art collector. Art can save you, too, help keep the mundane at bay, even if only as an art owner. Go enjoy art today, go smile at the roads not taken and the roads you have taken. Insert yourself into that piece of art and have a flipping ball. In fact, be the belle of that ball. Own it, my friends, and I’ll keep creating!